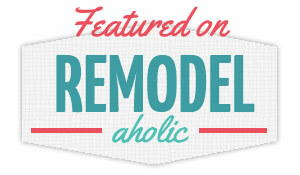 The Happy Homebodies: Nursery Update: Too Much Cuteness! Remember when I painted this nursery mural for our friends Erin and Charley a few weeks back? This is a small room, so they made use of every spare inch. Check out the great storage solutions in the closet! The daybed boasts hidden storage, too, filled to the brim with adorable tiny baby clothes. They scored this crib at a garage sale for $75! Great deal, right? It goes so well with the daybed, too. One of Erin's friends sewed that adorable Reiter pillow on the rocking chair, and it looks perfect in the room. Another friend made this really clever flower arrangement out of baby socks. So cute! I couldn't resist snapping a picture of the crib bedding that served as the inspiration for the whole room (and the tiny clothes)! 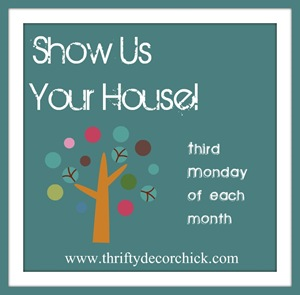 I'm sharing this over at Thrifty Decor Chick!